*Note: The above links to Amazon, Book Depository, Booksamillion.com are affiliate links. Affiliate links support giveaways for Somewhere Only We Know readers. Goodreads description--Stormie Omartian's bestselling The Power of a Praying series (more than 23 million copies sold) is rereleased with fresh new covers and new material to reach a still-growing market of readers eager to discover the power of prayer for their lives. The Power of a Praying Wife has sold more than 3.5 million copies and has encouraged countless women to trust God for their marriages. 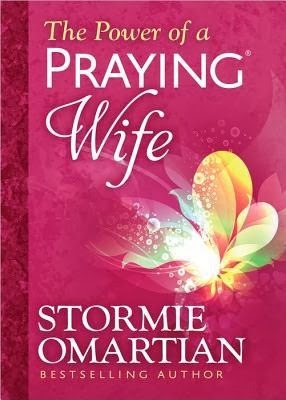 In this beautiful new padded hardcover edition, Stormie shares how God has strengthened her own marriage since she began to pray for her husband concerning key areas in his life, including his spiritual walk emotions role as father and leader security in work and finances health faith and future. If you desire a closer relationship with your husband, you will appreciate this refreshing look at the power of prayer in marriage. You guys, Stormie Omartian has taught me so much about prayer. I know you guys might be tired of seeing me review these books, but I just can’t help myself. The Power of a Praying Wife was the first of these books I ever read. I grew up being taught that prayer was important and we prayed before meal times and bedtimes, and I was told to pray throughout my life, for the sick, thanksgiving for our blessings, etc. But I had not made prayer a real part of my life. After reading a fiction book where the main character had a better prayer life with her fictitious god than I had with the One True God, I realized that I really needed to make this a priority in my life. And where better to start than to pray for my husband—I was newly married at the time. So I picked up this book for the first time. I remember what immediately impressed me upon my first reading was how Mrs. Omartian dedicates an entire chapter on praying for “His Wife.” In most cases, the person reading The Power of a Praying Wife is going to be the wife. And so Mrs. Omartian starts off the book with a chapter about praying for yourself because change always has to start with yourself. While you can pray for your spouse and while God will work because of that, this book is not designed to be about changing your husband. God is not a genie in a bottle that you rub when you pray and He pops out and asks you all of the many things you wish you could change about your husband, snaps His fingers and all of those things are now to your wishes and specifications. That’s not how this thing works. Truthfully the only person I can work on changing is myself. And so I was really impressed with her choice to start this book off about me instead of about my husband. Obviously, The Power of a Praying Wife does not address every possible thing that your husband needs prayer over. That’s just not possible. So someone looking for this book to cover every aspect that your husband will ever need prayed about in his life is going to be disappointed. What this book does is teach you how to focus your prayers on a specific area of your husband’s life and spend some dedicated time covering that topic, characteristic, aspect--whatever--in prayer. This can really apply to any aspect of your life and any relationship you have, not just your spouse. As a matter of fact while reading The Power of a Praying Wife this time, I thought of several chapter topics that some of my friends were struggling with and could use prayer in that area even more than my husband. The principle is the same. So obviously, this book isn’t going to have a prayer for every obstacle you might come up against as a wife praying for your husband. It doesn’t cover every prayer need your husband will have in his life. But it is a guide—and a really good one at that—designed to teach you how to focus your prayers for your husband to better yourself, to better him, and to better your marriage. The first time I read through this book, I took one chapter at a time. I would read that chapter and focus my prayer throughout the week in this area for my husband. And it worked really well for me then. This time I was aware of how short each chapter was and I just wanted to keep reading, to keep devouring this book, and to keep covering my husband with these prayers in the moment. Also, through this reading of The Power of a Praying Wife, I typed the prayers at the end of chapter and emailed them to my husband. Even though I did read multiple chapters in a day, I would only send him one prayer each day so as to not overwhelm him. I think there is something really special in sharing with that person the actual words You lift up in prayer on their behalf. It does a lot more for the soul than just saying “I’m praying for you.” I will add though that if you decide to share the prayers with your husband, you might want to preface that by telling him that you're about to share some prayers with him from this book and that it doesn't necessarily mean that you think he (or your marriage) is necessarily struggling in each of these areas, but these prayers can be used as preventative measures just as much as addressing an actual issue. The Power of a Praying Wife is a must read for any married woman of faith. I’d even recommend it to any and all people everywhere, but specifically for married women who want to cover their husbands in prayer. The Power of a Praying Wife gets 4.5 Stars from me. Have you read The Power of a Praying Wife? What did you think? Let me know! This review was originally posted at Somewhere Only We Know.